It was a pretty mundane pre-determination hearing in Grangemouth on Tuesday night until Ineos mentioned the need to close off a section of Bo’ness Road for a month. Members of Falkirk Council’s planning committee, representatives of Ineos and local community councils and residents gathered in the town’s Moray Primary School on Tuesday night to discuss plans to build a new energy plant and pipe bridge on land near Bo’ness Road. Ineos has made no secret about it’s desire to permanently close off a section of the A904 road – which runs through the heart of the site – and erect security gatehouses in order to improve safety at the site as it bids to attract new firms to call the area home. That plan is currently in limbo as Scottish Government ministers decide on the matter, but Ineos may get its wish to close the road – at least temporarily – if it gets the green light to build its new energy plant. Planning convener David Alexander revealed there were no representations or objections from any bodies regarding the application – including the Scottish Environment Protection Agency, Scottish Natural Heritage and Grangemouth and Skinflats Community Council. Classed as a national development, the application site extends to 4.5 hectares and lies to the south of Bo’ness Road on brownfield land on the existing petrochemical site. The proposed development would have the capacity to produce up to 435 megawatts of high pressure steam to be utilised in the industrial process undertaken at the Grangemouth complex. 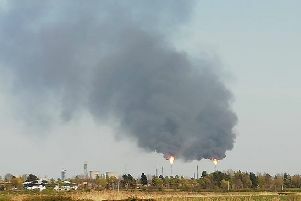 The site would be linked to the existing infrastructure of the Grangemouth complex and, if permission is granted, would include three boilers, with associated flues, to generate superheated high pressure steam. The height of the boiler structures will be approximately 25 metres and three flues, or chimneys, will be approximately 65 metres in height. A pipe bridge will also be required to span Bo’ness Road to provide the required connection to the rest of the site and the road will required to be closed for a month to allow work to be carried out. Councillor Joan Coombes was puzzled Bo’ness Road would only be closed for a month to construct the pipe bridge, when it was closed for a year in order to carry out similar work in 2015. Ineos project manage Nigel Falcon responded the construction of the pipe bridge was a relatively simple process, with the supports being put in place and the bridge being lifted into place. Ineos say the proposed new energy plant, which will be powered by a combination of ethane, waste gas, natural gas and gas from the Forties pipeline, is required to provide a contingency source of steam and electrical power generation to support continuity of supply and therefore the long-term viability of the Grangemouth Complex. During construction there will be 40 pre-fabricated modules of various sizes being transported to the site – the majority will be able to be carried on lorries, but the three boiler modules are so large they will require special measures to get them to the site and will be moved from the docks, through Ineos land and onto Bo’ness Road during the night or at the weekend. Mr Falcon said: “We are looking to start construction in 2019 and this will last up to two years with the plant commissioned in late 2020 or early 2021. We are looking at two million man hours of construction and will have around 190 people coming into the area over a two-year period. The application will go before all members of Falkirk Council later this year for them to decide whether to grant or refuse permission.